I’m always on the lookout for recipes that will give me reasonably low-calorie lunches and dinners, because my diet doesn’t leave a lot of room for thousand-calorie meals. (Alternatively, I’m always on the lookout for reasonably low-calorie meals so I have enough headroom to eat as much chocolate as I want!) Joanne Chang is not really a chef you associate with “low calorie” by any stretch; before my diet I used to go to her bakery-cafe, Flour, and get a roast-beef sandwich and a brownie for lunch — then I learned that combination was nearly 2,000 calories just by itself, which would leave me well over my target even if I fasted for the rest of the day. But if you’re careful with the portion control, some of the recipes in her cookbooks Flour and Flour, too can actually be part of a healthy diet. 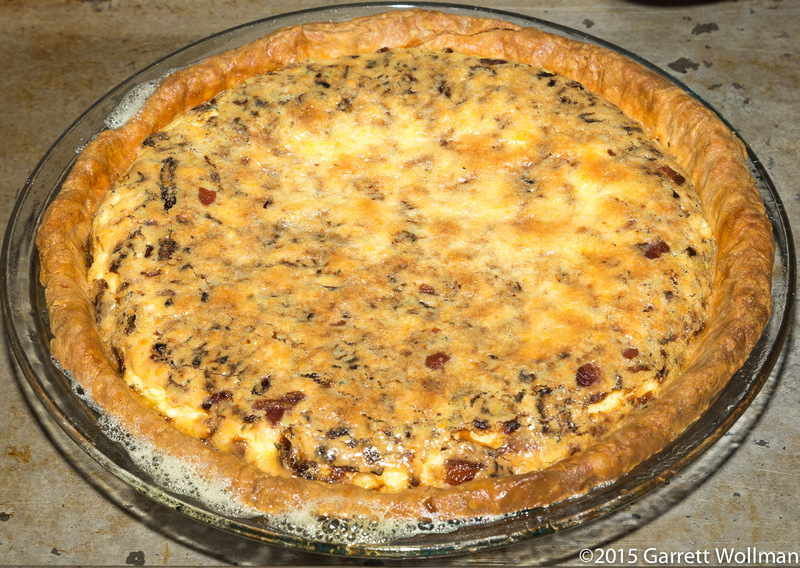 So it is with this quiche, one of the few savory recipes included in her first cookbook ( Flour , Chronicle Books, 2010; p. 241). It’s actually an alternative filling for her “Country Ham, Cheddar, and Tomato Quiche”, which I hope to do some time in the summer when tomatoes are actually flavorful and in season — the basic procedure is really a general construction for any sort of quiche, and she also gives two other alternative flavorings (one with smoked salmon and a vegetarian one with spinach and zucchini). I usually start these writeups with a photo of the mise en place, but because of the time required to prepare the filling, I didn’t do any mise this time — the filling ingredients were left in the fridge until ready to cook. 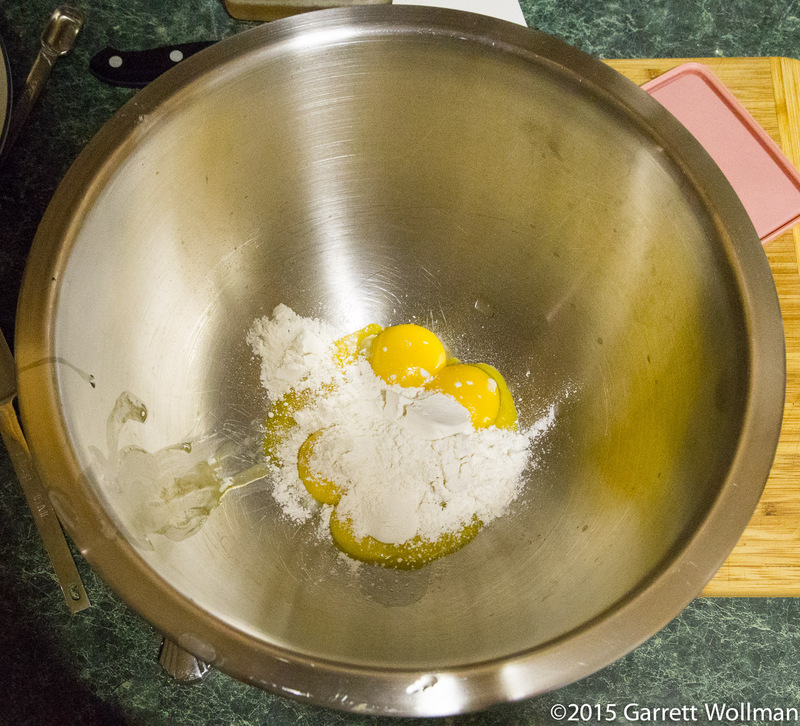 The recipe starts with Chang’s standard “Pâte Brisée II” pie shell (see my tutorial for the full details). In this case, it’s fully blind-baked, and I deviated from her instructions somewhat by docking the crust and applying egg-white glaze towards the end of baking — and of course I used aluminum foil rather than parchment to hold the weights (navy beans). 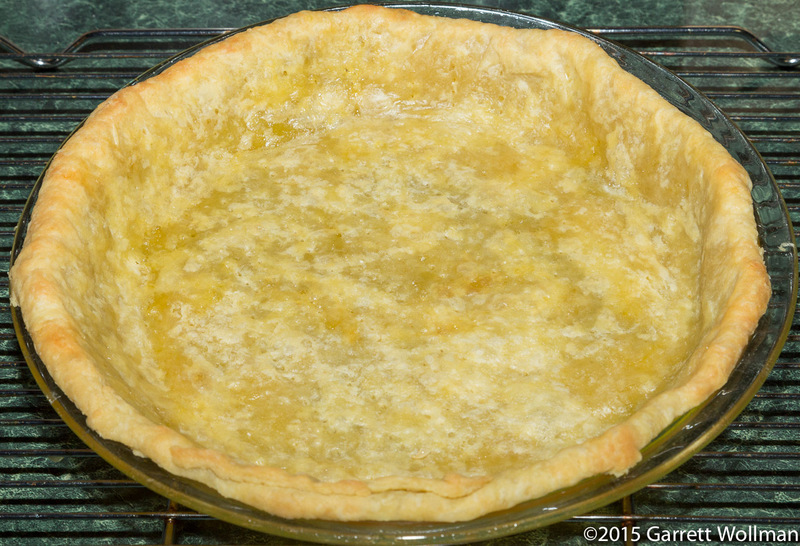 She does note that this pie does not require a tall crimped edge, so I went for a simpler treatment — I could have made it prettier by pressing it with the tines of a fork, but I just left it plain. 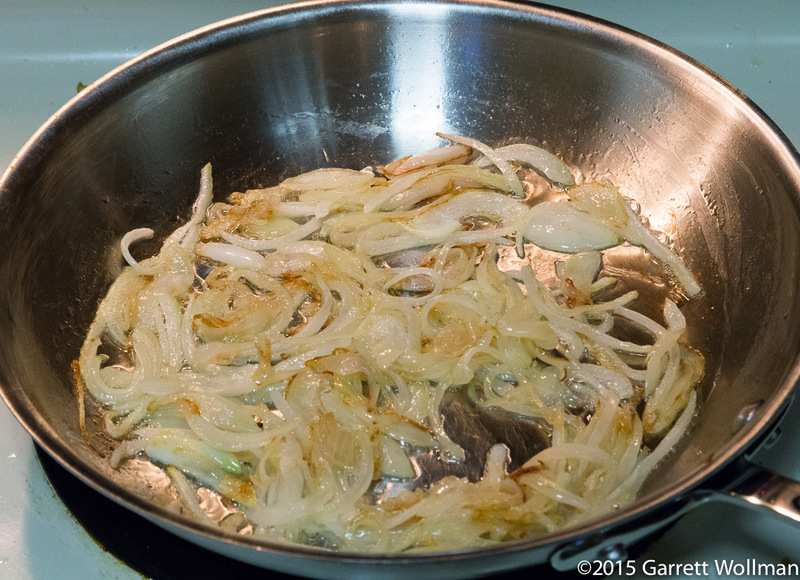 The next phase of preparation is to make the caramelized-onion part of the filling. Surprisingly to me at least, it calls for cooking the onions in oil, rather than bacon dripping (which I would cheerfully have used) — and it only calls for cooking a single small onion. I wouldn’t have minded about double the onion. 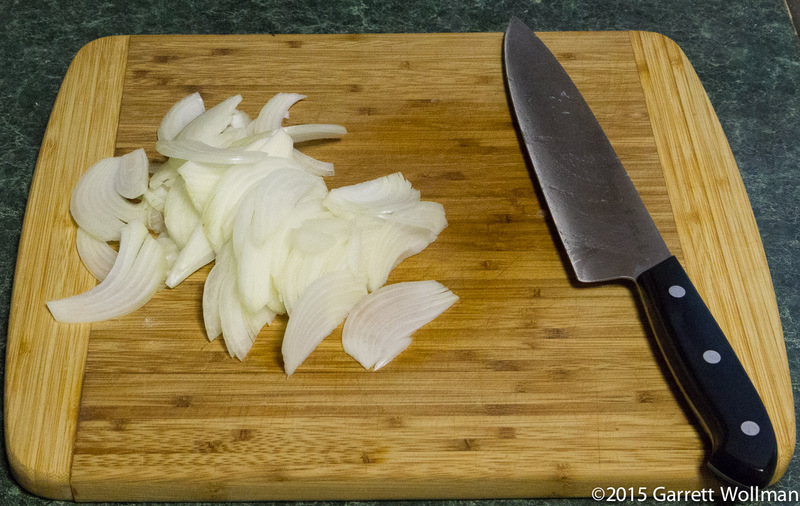 Usually when cooking onion, this is the point at which it’s done — the slices are completely softened and beginning to take on some color. 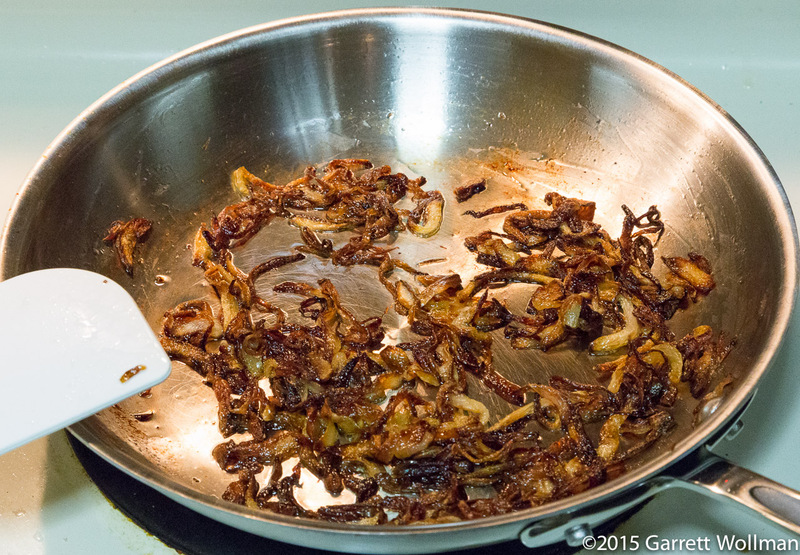 But in this case, we want fully caramelized onions, which means another twenty minutes or so of cooking. Unfortunately, this means that the onions absorb pretty much all of the cooking oil, as their natural water evaporates. Now after about 35 minutes of cooking over fairly low heat the onions are fully caramelized and in fact a bit crispy (which they really shouldn’t be). 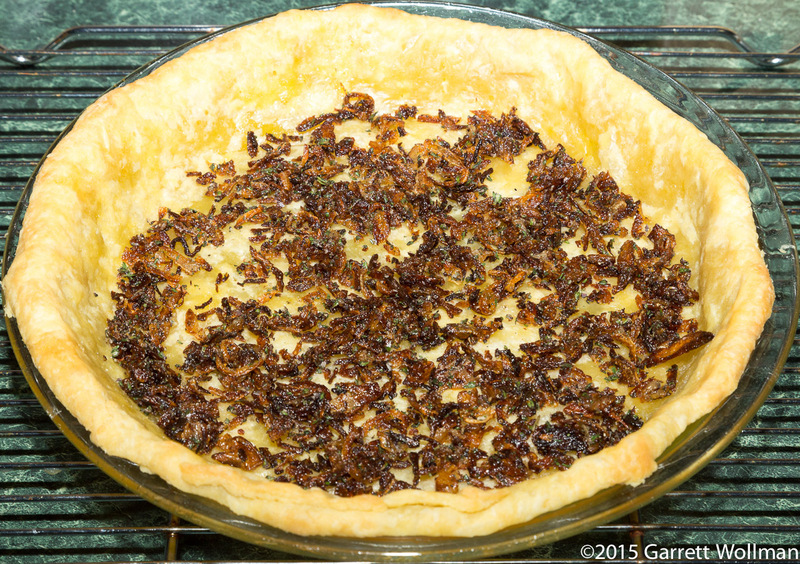 After the onions are completely cool, they are chopped, seasoned with salt and pepper, and mixed with some chopped fresh thyme; this is then spread across the bottom of the baked pie shell to form the first layer of the quiche filling. Meanwhile, a few rashers of bacon are rendering in the pan; when they’re done, they get chopped up as well and added to the pie shell on top of the onion mixture. 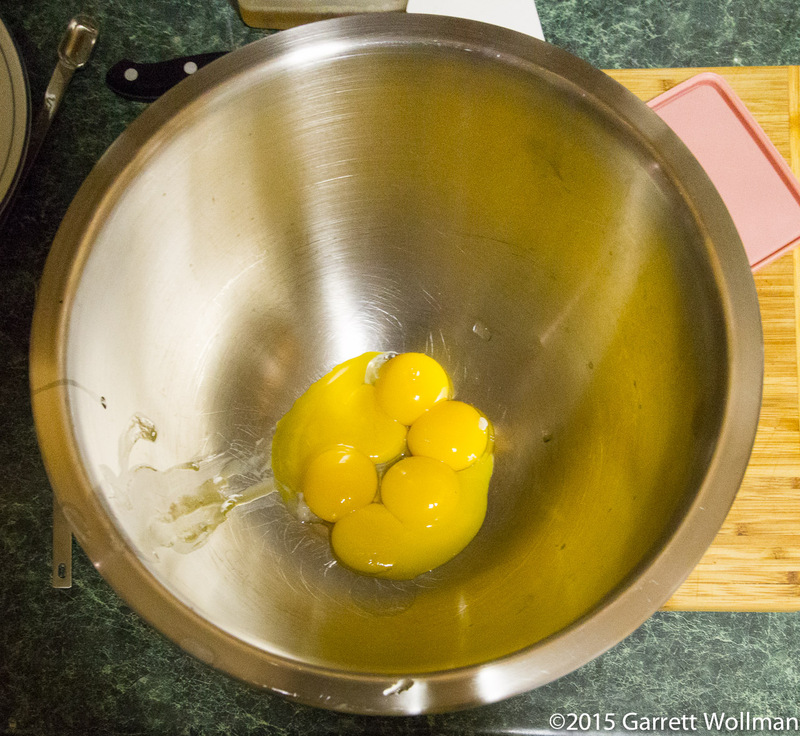 To replace the thickening power lost by leaving out the albumin, the egg yolks are augmented with a starch — in this case, three tablespoons of regular all-purpose flour. The flour and yolks are whisked together to form a paste before adding the dairy part of the custard: one cup (240 ml) each of heavy cream and half-and-half. I guess I’ll have to bring the half-and-half in to work, as I don’t have any plans to make another recipe that calls for it before it expires. (Not sure what I’ll do with the cream, either, but I’ll find something — whipped cream is easy to make and goes with a lot of things!) The custard base is seasoned with more salt and pepper, and spiced with a very large quantity (½ tsp) of freshly grated nutmeg. 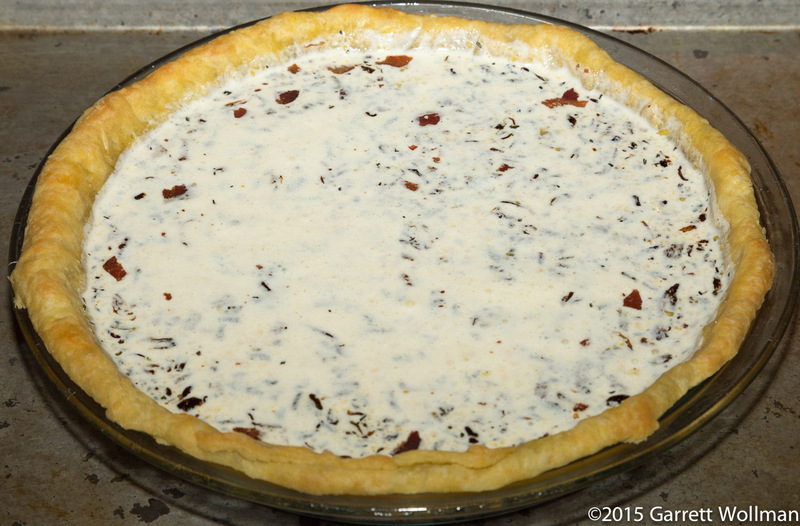 After pouring the custard base over the flavoring ingredients in the pie shell, a lot of the onion and thyme floated up into custard base. 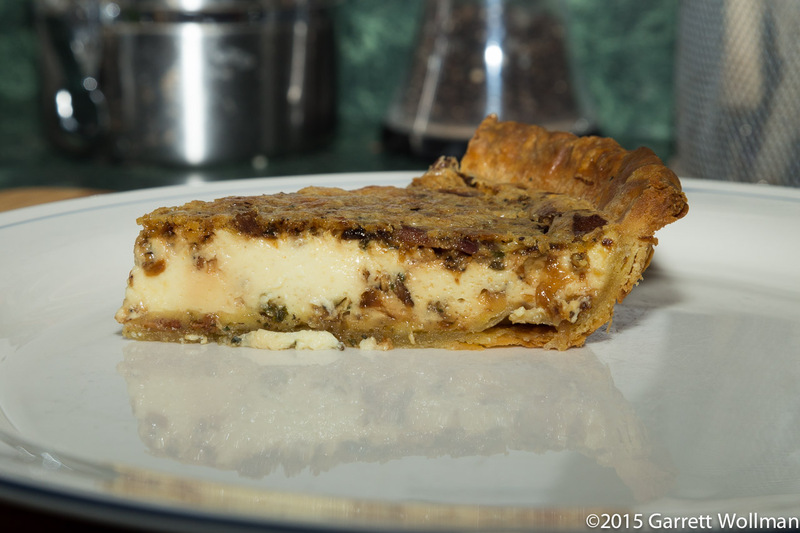 The quiche was baked (on a half-sheet pan to catch any spills) in a 350°F (175°C) oven for nearly an hour. To complete my dinner, I added another of eggs’ best buds, asparagus — simply steamed in a skillet with a bit of water and a pat of butter. The total nutritional value comes in under 550 calories, which is a pretty big win in my book. I cut the quiche into eight pieces; Chang’s recipe says “serves 6 to 8”, and it would obviously be a bit higher-calorie (although still delicious) with larger slices. Being a single guy, it will be a bit of a challenge to eat all this quiche in less than a week — pretty clearly I’ll have to have it at least once every day, and I already know that there will be two days of free lunch at work, so I guess that sandwich bread I bought will have to go into the freezer. 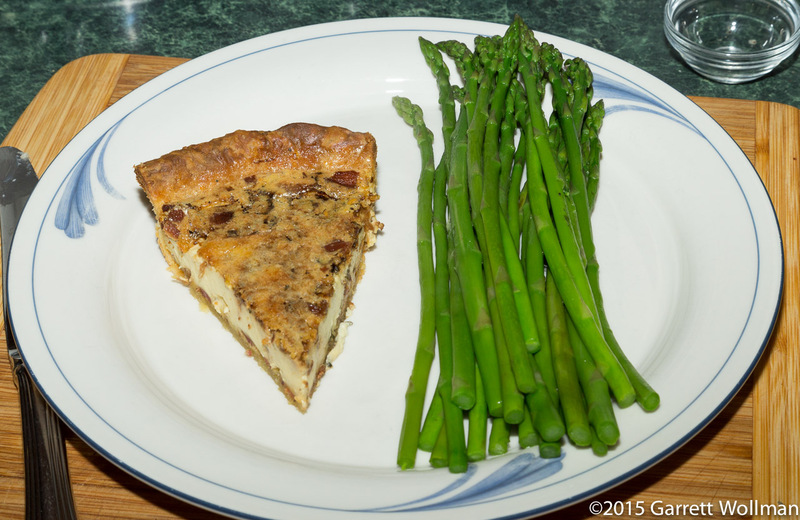 (Between this quiche and yesterday’s macaroni and cheese I’ll have all the food I need for a whole week — which was kind of the point. Probably more bacon than I’ve eaten in a really long time, though! 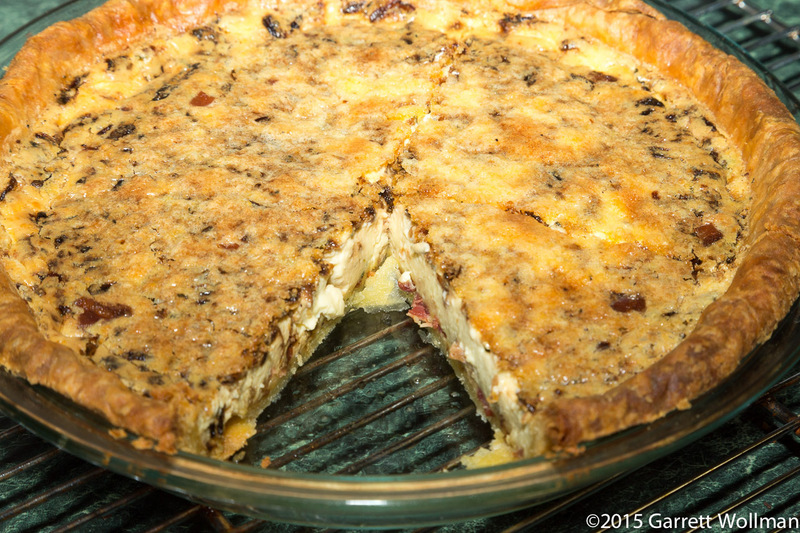 Gallery | This entry was posted in Food and tagged Joanne Chang, quiche, recipe. Bookmark the permalink.